Canvassers who know how to use their field materials are not only more confident and effective – they save organizers hours of work on the back end. Entering information into the database after a walk mobilization consumes enough of your staff’s time and patience as it is – but when canvassers fill out their walk-sheets incorrectly, the process can become a real headache. The best prevention is good training. Walk lists are seldom straightforward. These closely-printed lists contain a great deal of highly condensed information including voters’ names, addresses, ID numbers or barcodes. They may also indicate voting frequency and sometimes organizers choose to print walk lists that indicate voters’ previous interactions with the organization or project – for instance, issues they ID’d in conversation with another canvasser. If canvassers are doing a survey, the walk lists needs a place where they can circle voters' responses. (For more on walk-sheets, see List Production and Data Entry). A typical walk list has multiple fields, abbreviations and codes; a canvasser has to understand what all the pieces mean in order to fill out the sheet properly. Furthermore, they’ve got to know how to get the right information out of voters and accurately record their responses. ALLERT organizers, Anthony Thigpenn explains, teach canvassers (or “precinct leaders”) about the walk list itself – the “universe” of voters they’ll be contacting – as well as how to record ambivalent or unclear responses. During field training, they also go over the script with canvassers and set up short role play activities to get them comfortable with the key points of the questions. Have canvassers practice asking the questions that they’ll ask voters and discuss how they’d mark different answers. If all goes well, canvassers will return from door-knocking with information about the voters they contacted marked on their walk lists that staff members (or other volunteers) can easily input into the database. In the second video, Risa Brown, SCOPE’s Information Technology Associate, goes through the folder that ALLERT sends out with each team of door-knockers and briefly explains how they “wand” in the data after the canvass (that is, use a barcode reader to quickly enter voters’ responses into the database.) We’ll hear more from Risa about this incredibly efficient method of data-entry in the Barcode Scanner section. The canvassers will be carrying a flyer about the campaign which Gloria tells them they can offer to everyone on their list and leave for people who aren’t home. The flyer has a tear-off portion where voters can mark if they’re interested in volunteering; “it’s always important to recruit,” Gloria says. They’re also walking with a nonpartisan voter guide that provides information on other ballot initiatives which they should distribute only if requested; __ reminds canvassers that their priorities are Props. 66 and 72 and they won’t have time to engage in conversation on other issues. When you send out other pieces of literature with volunteers, they should go out your door knowing exactly in which circumstances and at which doors they are supposed to leave which pieces. And if you ask them to write notes on door-hangers, should also tell them just what to say. You will always have some volunteer door-knockers who “just want to get started.” If you have to, you can let them skip the pep talk and the issue education, but you must teach them how to use the lists, make sure they know where to go and when to come back. 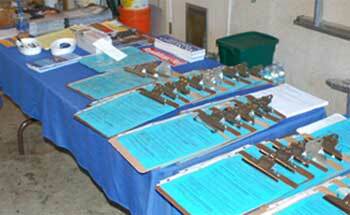 For more on training canvassers, see How to Put on a Walk Mobilization.